Mahoutsukai no Yome’s Magical Realism | UEM! We begin with simple, muted shots of London, closing in on a humble workshop. Though Angelica Barlei quickly reveals herself as a master of magic, her immediate appearance is simple; nothing like the beast-headed magician we’ve seen in promotional material, that we’ll see later. Our first foray into magic is signified not by Angie, but by her fairy assistant. The fairy’s presence speaks of Angie’s magic before she does. Likewise, as Angie begins her work, creatures materialize around her to watch with childlike curiosity. Angie’s mastery isn’t something she exclaims herself; it’s defined by the actions of characters around her, and by her own actions after that. Her normalcy makes the magic around her normal, familiar, and seemingly entirely within her control – and, by extension, within humanity’s. The same sense is delivered when we first meet Chise; her awakening is typical, pastoral, idyllic, and yet we then turn the camera to a man with a beast’s skull for a head. Immediately we know they co-exist in peace. Perhaps the best microcosm for this co-existence is Ruth, at first a man-like dog before transforming into a dog-like boy. It’s common for many beginning writers of fantasy to think that the only way to capture an imagination is to make your ideas and characters as grand as possible. But we love The Lord of the Rings because we get to see such a grand world through a hobbit’s humble perspective. Goliath was only a legendary figure because men were smaller than him. The potential of the unbelievable is exacted not in how great it’s said to be, but through the relationships it has with smaller and simpler things. Mahoutsukai no Yome’s magic is immediately immersing because it’s grounded in a sense of the everyday. It operates through what Roland Barthes (the Death of the Author guy) would term the ‘proairetic code’. One of the most common ways to create suspense in a story, says Barthes, is by having important events preceded by the simple and unassuming. The longer we’re in the familiar, the more expectant we become of the unfamiliar. Particularly as stories begin, our brains are coded to consider every initial sense of normalcy as transient, awaiting the inciting incident of newness that whisks our characters into the thick of the plot. Angie’s workshop scene follows this rule, not only by beginning with the normal, but by normalizing little matters of magic in order to make her spectacle more amazing. 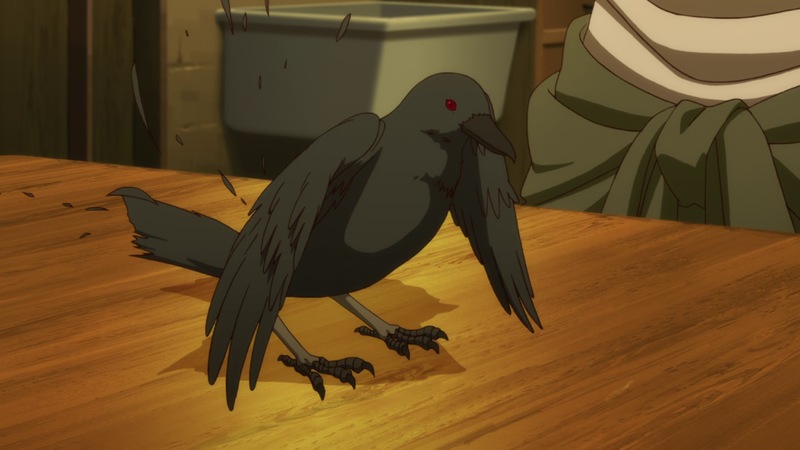 But it all gets condensed into the illusion of a crow, and thus the most impactful aspect of her magic, born from a sense of the simple, is how it wraps itself in simplicity once again. This foreshadows what the mundane events of Chise’s life build up to. Elias and Ruth are normalized. The way Elias discusses magic balances on the liminality between typical scholarship and the supernatural. Angie’s books arrive in a blast of excitement, but they’re quickly organized by Elias in a way befitting any delivery. In all this, we expect part of the arrival to contain something game-changing. But Mahoutsukai no Yome throws us for a loop. 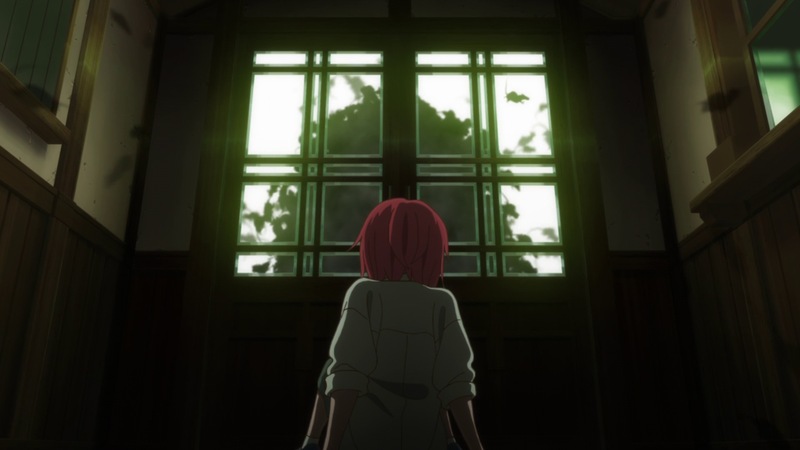 Though Chise’s reluctance to explain the thin, nostalgic book provokes Elias to display the power he keeps hidden under his barely-moving skull, the centerpiece, the result of all this buildup, becomes Chise herself. Her childhood. Her battle with being an outcast. 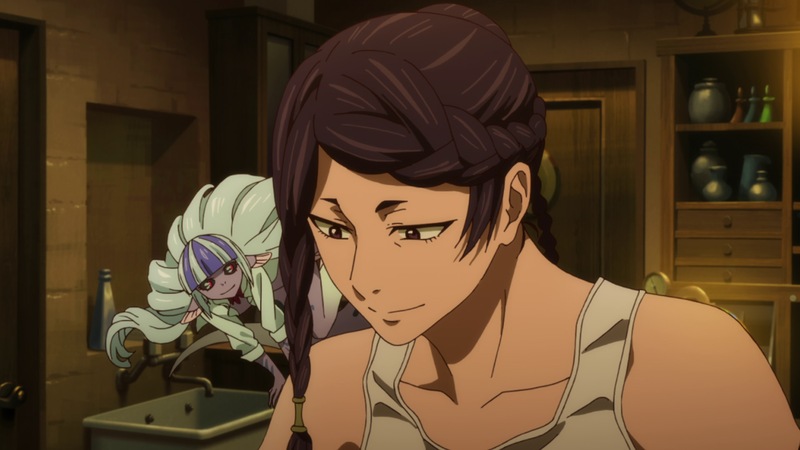 The way they’re sat, Elias should be the storyteller, but it’s Chise’s tale we hear, a narrative entirely new to her guardian, it seems. Her story – what we have seen of it so far – is a common tale of being outcast and misunderstood by the world around you. You can’t explain what you see or how you feel, because everyone around you is missing vital pieces of the puzzle. Because your version of reality is rejected by them, reality becomes a nightmare to you. You’re afraid to wander where others walk freely, and you don’t feel safe in any sanctuary. This story is played out every day by people whose identities – be they ethical, sexual, religious – are shunned because they can never be fully explained to those that do not hold them. 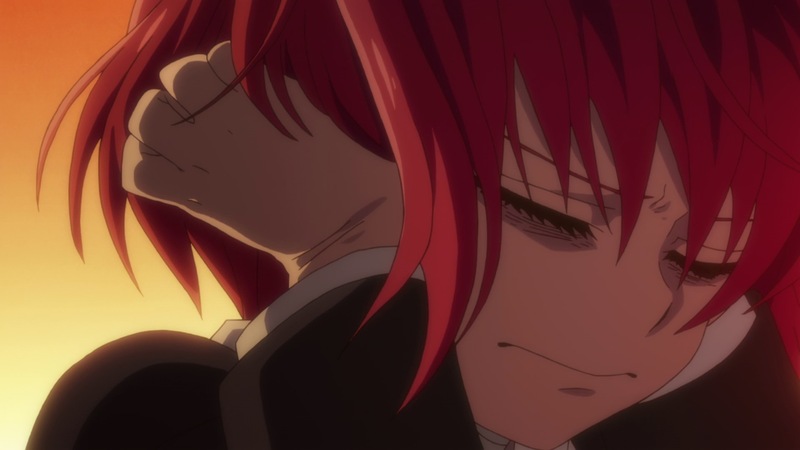 Some who are shunned have the strength to fight back; but many are like Chise, and are forced to become withdrawn because society isn’t accommodating to anything it can’t understand. The magic of Mahoutsukai no Yome is not what the mundane builds up to; both normalcy and fantasy act as enablers for the audience to reach the beginnings of a relatable moral story about what it’s like to see every speck of commodity as a waking nightmare. That story is both ‘real’ in its actuality, but ‘fantasy’ in its actualization, and in its sense of alien-ness to many people. As so many ‘normal people’ can’t understand what Chise is going through, we can figure that those ‘normal people’ couldn’t understand or relate to this story either – to the idea of being marginalized because of things you can’t explain. Thus, as willing recipients of this story, Mahoutsukai no Yome goes beyond merely normalizing its fantastical elements – it elevates its ‘normal’ viewers into a state of being magical themselves. 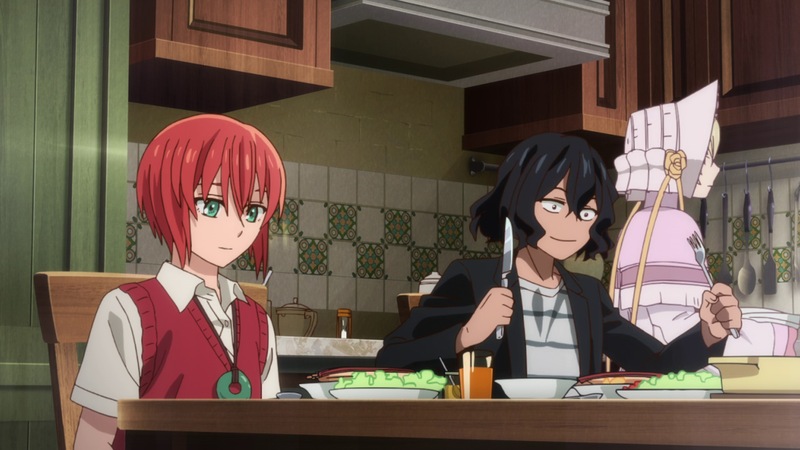 We feel separate from the normal world; we’re on Chise’s side. But we don’t literally gain any of her powers. The power of fiction is transformative and liminal; we are both a real and a magical audience. 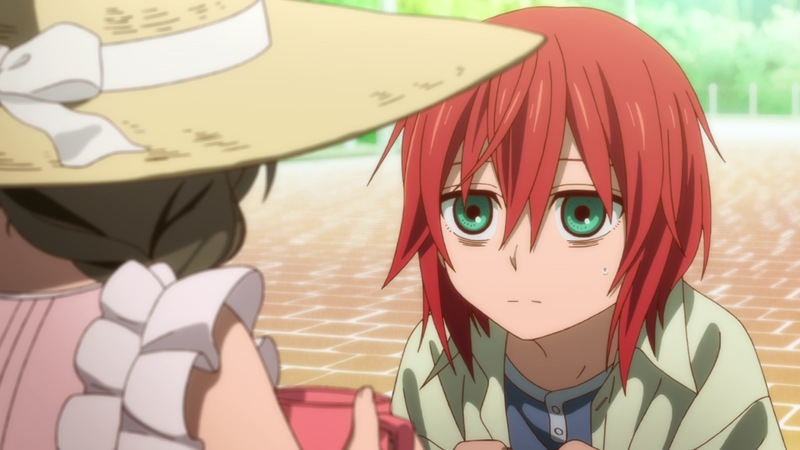 But with Chise a young girl, and a sunhat-wearing girl willing to approach her, perhaps it is not elevation we feel, but a reduction back to the wisdom of childhood, that sees the imagination as a vital part of reality, and does not shun imaginations that don’t fit its own. But Mahoutsukai no Yome suggests that it isn’t such a one-way street, and neither is there a clear distinction between the real and the unreal. While the mundane is given meaning through the mystical, the magic of the show comes to life only because it’s grounded in normality, and because we’re de-normalized through experiencing it all. It’s not the monsters that are all that matter to Chise, as much as she is consumed by her fear of them in her time of loneliness. What matters is how they penetrate the reality the rest of the world presents as normal – her reality, and ours as well, to forge a newer sense of reality for her, and a newer awareness to the ‘reality’ of marginalization for us. The uncovering of the sinister questions realness itself. Fantasies like Mahoutsukai no Yome do more than just give our world meaning: in the fullness of magic realism, the fiction and the real world temporarily, transformatively become one. To suspend disbelief is not merely to enter a new world, but to let one’s ‘real’ world enter with them, and merge with the magical more or less entirely. If there’s one reason Qualidea Code’s first episode fell completely flat for me, it’s that it injected the supernatural into the natural without any sense of subtlety. Neither the teenagers nor the powers they wielded spoke of anything relatably human, as much as both were normalized into their world; they became boringly normal, rather than insightfully normal. It all felt like fantasy, and thus unbelievable. Even the ‘normal’ moments – those shots of Canaria in the shower, for instance – felt only like a hyper-reality divorced not only from our world, but from the story’s world too. In Mahoutsukai no Yome, every fantastical feature is integrated into the story’s world, and offers something to say about our world too. That double voice, of fiction being able to speak of reality while maintaining its grip on the story, is what the subtlety of magic realism thrives on. It’s what makes the emotional struggle of Madoka Magica so pertinent to our lives and so characterizing of the characters, and their archetypes and archetypal narratives, at the same time. Magic Realism is not simply about putting magic into the mundane, to make it stand out. It’s about weaving the two together to make reality stand out anew as something fantastical, whether that’s to praise parts of it, or – more frequently, it seems – to question what constructs of ‘realness’ we build around our lives. We’ll have to wait until next year to see how Chise’s struggle with a new ‘reality’ continues on our screens, though the manga is ongoing and far ahead if you can’t contain your curiosity. For now I hope the Autumn season brings gems that treat fantasy like Mahoutsukai no Yome, as a window into expressing crucial stories close to our hearts in garish and ghastly forms we may not have seen before. The unknowns of magical monsters keep us unhinged towards considering the unknowns of our own lives, unknowns we might scorn or run away from at first, like Chise. But if they’re revealed to us through the power of fiction, we may come to accept them, no matter how far they feel from our understanding. If you haven’t watched Mahoutsukai no Yome and this article has piqued your interest, it’s available to stream on Crunchyroll. To help fund the research for more articles like these, please consider supporting UEM via Patreon!